During past 20 years, our market has been remarkable and sustained growth ! 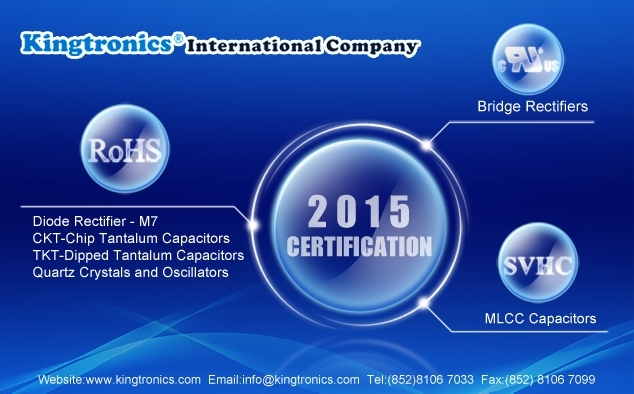 In order to thanks for every customer's great business support, and make our products more persuasive when you promoting, at the early of 2015, we kingtronics give latest certification update for below strong parts. 3.Monolithic ceramic capacitors/Axial Monolithic Ceramic capacitors/ Axial Color Ring Capacitors/ SMD Multilayer Ceramic capacitors/ Ceramic Capacitors are tested not including 155 substances of very high concern(SVHC) under Regulation(EC) No 1907/2006 of Reach. And our Quartz Crystals and Oscillators RoHS 2.0 certification will come soon.